Apple Mania … I confess! I recently read a little article that says that someone has decided that Apple is now a religion .. that people who are Apple fans (fanatics, like me!) have similar responses when they view that neat little Apple logo (or another symbol related to the fabulous Mac world like the iCloud logo to the right) that religious folks have when they view a symbol of their religion! So I confess — guilty as charged! I won’t bore you with all the reasons why this brand and its products are so appealing to me. Suffice it to say that once I made the switch, a huge burden of constant computer problems vanished from my life. Now for those who have a history of religious upbringing like I do, that sort of sounds familiar, doesn’t it?! 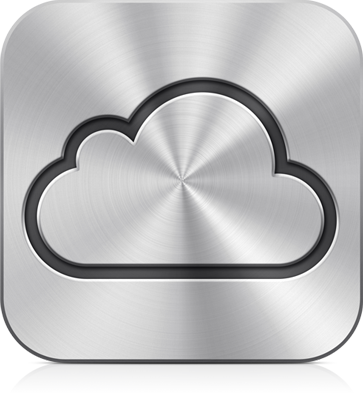 iCloud is supposed to “fix” all of this and make Apple devices work better than ever. As a huge fan who is totally dependent on “the cloud” as it now exists for me on Dropbox and various other web places where I keep various stuff, I cannot wait to see just how “true” this claim is! Meanwhile, I am absorbing all the tech stuff I can read (and understand) about what is coming, and I will let you know how it goes! This entry was posted in Humor, Technology and tagged Apple, cloud, iCloud, Mac. Bookmark the permalink. 1 Response to Apple Mania … I confess! I’ve been trying to tell people of the joys of Apple for over 20 years – a voice crying in the wilderness. In the early Apple days, proponents were called evangelists. How’s that for religious?? ?